Bottles are dispatched within a few days of cleared payment being received and are shipped worldwide by our internationally known couriers. As previously mentioned, all aspects of the transaction in terms of purchase or receipt of items must be adhered to by people of legal age for the jurisdiction of the countries they reside in. Our shipping costs are determined by the weight of the packages sent. Indicative cost is approx.2kg per 700ml bottle, but this an approximation as bottles in wood display cases would raise the weight and be a higher cost. Once dispatched, there is a tracking function available to both you as the buyer and us as the people dispatching the item. The items must be signed for on receipt ensuring the items are in good condition. It is free to collect bottles from our office within office hours or by special agreed arrangement. Should the items not be collected within the terms stated in our terms and conditions, the charge stated shall apply. We group bottles together whenever possible so that may result in more than one package arriving on delivery. Your package or packages are shipped at your risk and we take care in packaging to protect fragile items. Insurance is available on request at checkout at an additional cost of 3% of the final agreed price of the total goods price. 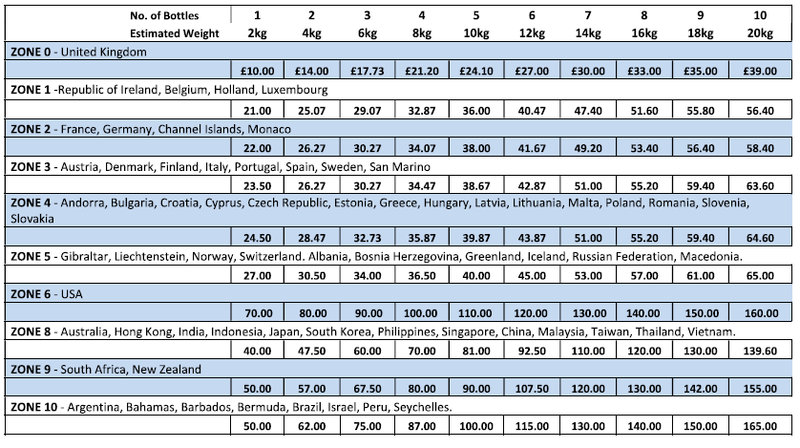 Vat is applied to UK and EU countries to that premium. If damage does occur, the bottle must be sent back to us to process the claim. We require the neck of the bottle with the stopper, cork or screwcap in place and the seal in place. Bottles are not insured for leaks, only breakage or loss. We have been advised by our courier that delivery shall be within 2 days and must be signed for. To deliver to remote areas within the UK , there is an extra charge of £6 inclusive of vat and a Remote Area Postcode List is available to determine your location. Shipping is possible to most locations in the world with exceptions of Canada and USA, where we can ship to licenced premises and provide a cost for this on request prior to submitting any offers and Canada. Buyers are responsible for any additional customs or other charges after the items leave our premises. We can provide a cost on request to any country in the world and if yours is not included in the zones stated on the list below, please contact us by email and we shall provide a cost. This should be done prior to submitting tenders for any of our items.